For those too young to have known the Cold War, especially the bristling confrontations of the 1950s-60s, it is hard to appreciate the oh-so-real feeling that nuclear destruction was imminent. This sense of threat of the coming global obliteration reached fever pitch in 1963 with the Cuban missile crisis and the stand-off between the US and the Soviet Union. The Soviets sought a military base within striking distance of the US mainland as a counter to the American’s strategic positioning of military forces and nuclear weapons in Europe and Turkey which targeted and encircled the USSR. Regardless of one’s politics, left or right, people thought the world was set for nuclear confrontation. In the event Kennedy won when it was said Khrushchev “blinked”; the missiles were withdrawn. The Cuban Crisis was a high point which emphasised the reality of inter-imperialist rivalries between the Soviets and the USA which would probably end in all-out war. But years before this crisis, Britain had seen an opposition mobilised against nuclear weapons which culminated in the formation of the Campaign for Nuclear Disarmament (probably best remembered for its marches to Aldermaston). CND drew together elements from the left, ranging from Christian pacifists, moderate Labour through to the Communist Party and more radical groups such as anarchists. Faced with a clear British Government policy (both Labour and Tory) of retaining an “independent” nuclear deterrent and agreement that US forces could use Britain as a nuclear base, it was not surprising that CND’s dolly-mixture support base was liable to splinter over both political goals and strategies. So it was. Some argued that peaceful marches to Aldermaston were of no use and that more direct, confrontational action was required. It was this thinking which gave birth, in 1960, to the Committee of 100 dedicated to direct, if non-violent, confrontation with forces of the state. Mass sit-down demonstrations became the tactic of choice. These, often far from peaceful acts, led to arrests and the gaoling of activists. 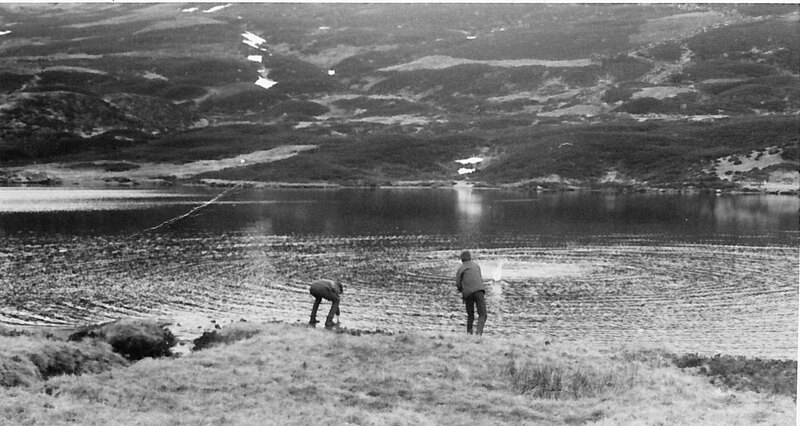 Trafalgar Square, the Holy Loch and US air bases became focal points of activity. Radicalisation increased which, with the emergence of the Vietnam War, again raised the possibility of nuclear confrontation as a result of the roles played by the contending powers of the USSR and the USA in this bloody conflict. So anti-nuclear forces found themselves confronted not simply (if that’s the right word) with the morality of nuclear weapons but questions over imperialist struggles in the larger world. 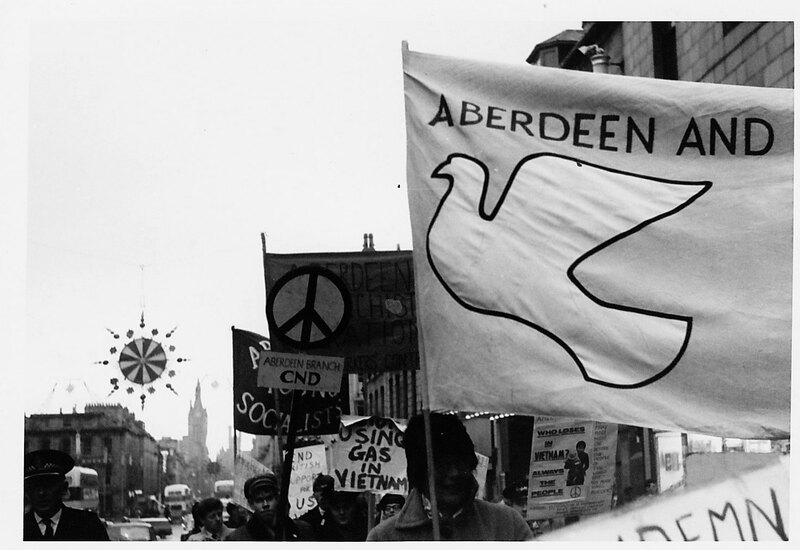 Aberdeen YCND emerged around 1963 from this melange; moral and political oppositions to nuclear weapons. One of the founders played a crucial role in creating what turned out to be a very radicalised and confrontational body. 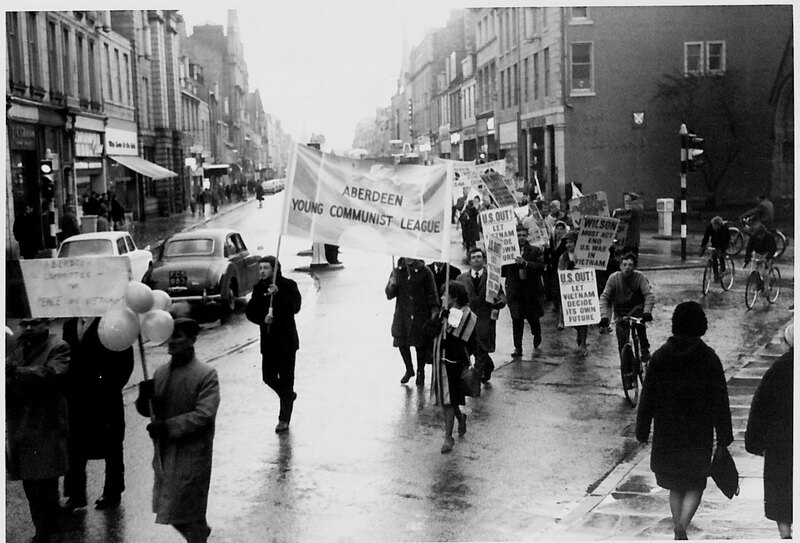 He not only began an active Aberdeen group but also brought with him knowledge of the Committee of 100 (by 1963 a significantly more radical group than it had been in 1960). In addition, and this put a clear stamp on Aberdeen YCND, he was committed to anarchist politics. This meant he rejected, at least in principle, working with other political factions such as the Labour Party and the Communist Party and rejected peaceful action as a way forward. Just in passing it’s worth noting that he, along with another prominent member, was also active in the folk music world. In the 1950s and ‘60s folk music was highly political with, for example, Pete Seeger in the States and Ewan MacColl in Britain linking the tradition to current political and class struggles. 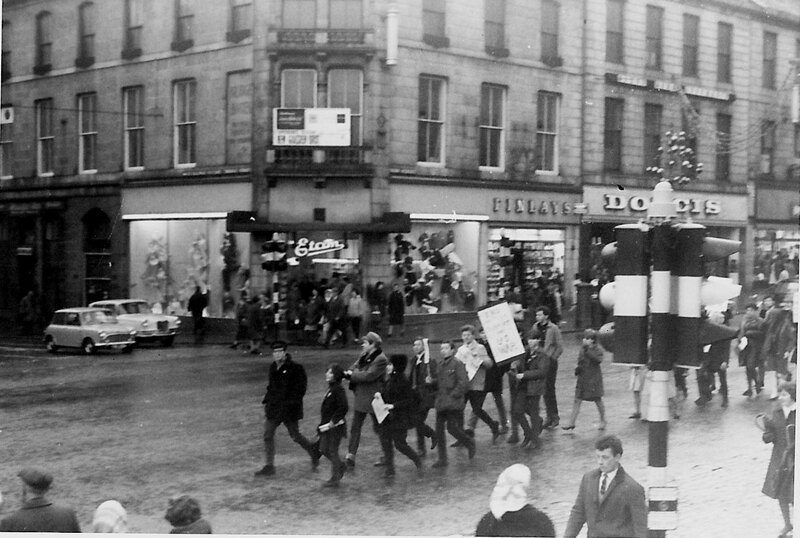 The American folk singer, Tom Paxton, was cheered on by Aberdeen YCND as he burned his draft card in the Castlegate (although no-one present would have known if it was genuine or not). YCND’s historical moment of coming into being also coincided with that time when the 1950s youth culture of Teddy Boys and early rock and roll was making way for new cultural identities and the austerity of post war Britain was being replaced by the “consumerist society”. There was a buzz in the air. YCND promised a place for youth to be radical, a place where young people could build their own identity, a place where they could be distinct and separate from the world of parents and elders and betters (in 1963 the oldest member was probably about nineteen). 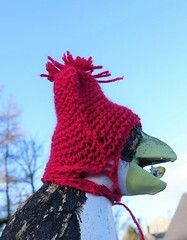 At the same time youth could look to creating a better and fairer world and it must be said have fun. And very soon the group became associated with the wide ranging politics of “flower power”. YCND members saw themselves as part of a global movement which protested against racism in the USA, bloody war in Vietnam, repression in the Soviet bloc and resisted the mind-numbing conformity of the West. 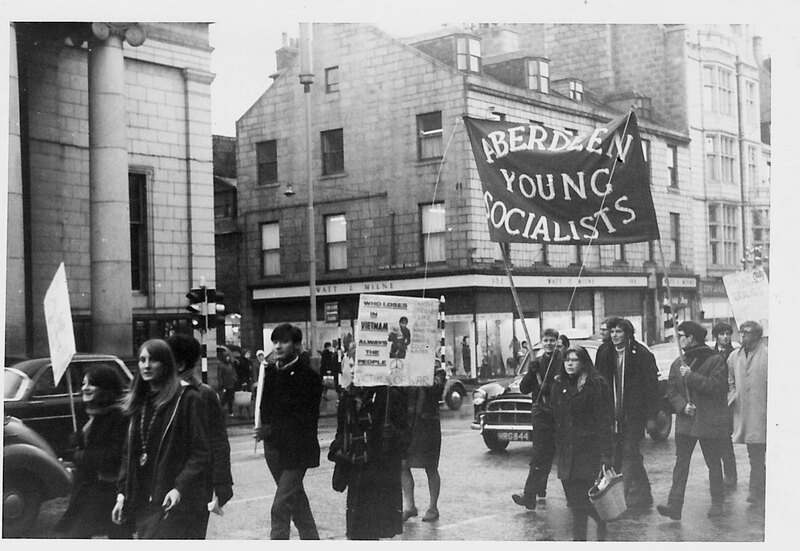 Aberdeen YCND being a product of youth, not an off-shoot of a parent CND, was dynamic and unrestrained in what it thought it could and should do. It was no respecter of persons or institutions. Not surprisingly this drew a response from many youngsters and the organisation attracted huge numbers of kids, some as young as 13 or 14, with an average age of probably no more than 16 or 17. 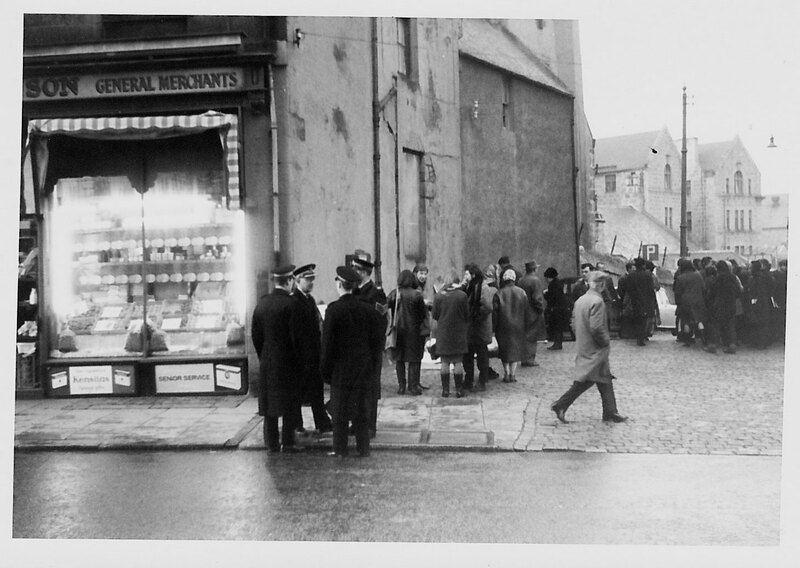 Younger elements of the group were involved in a school strike among Aberdeen schoolchildren, and ran off literature on the group’s messy duplicator, to hand out among their fellow school pupils. It often fell to the younger members to run down to the local newspaper on Broad Street with copies of motions carried at meetings and statements for the press, insisting that well-known journalist Arthur Argo made sure copy appeared, as demanded, in the edition of the paper. 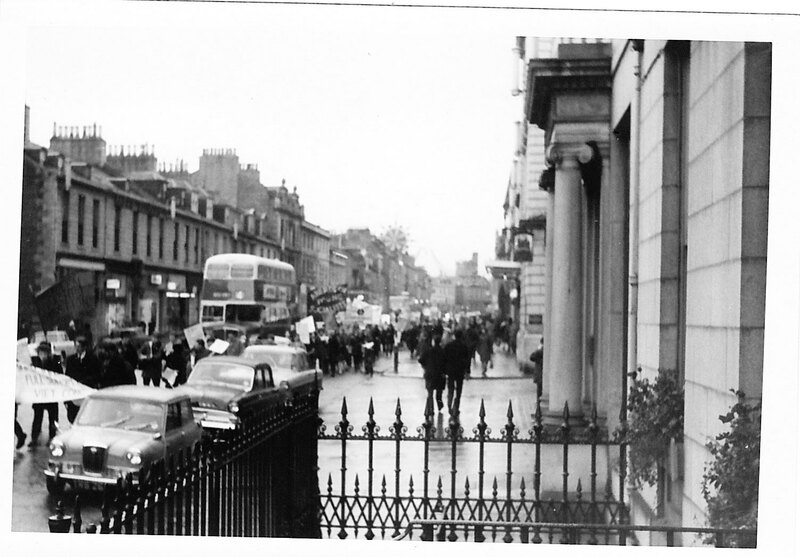 The group met weekly, on Sunday afternoons in the city’s Trades Hall (and sorely tested the patience of the the Secretary of Aberdeen Trades Council, Jimmy Milne). YCND became both an alternative political centre but also a social focal point with members of the organisation spending many hours in local cafes, older ones in pubs when money allowed. 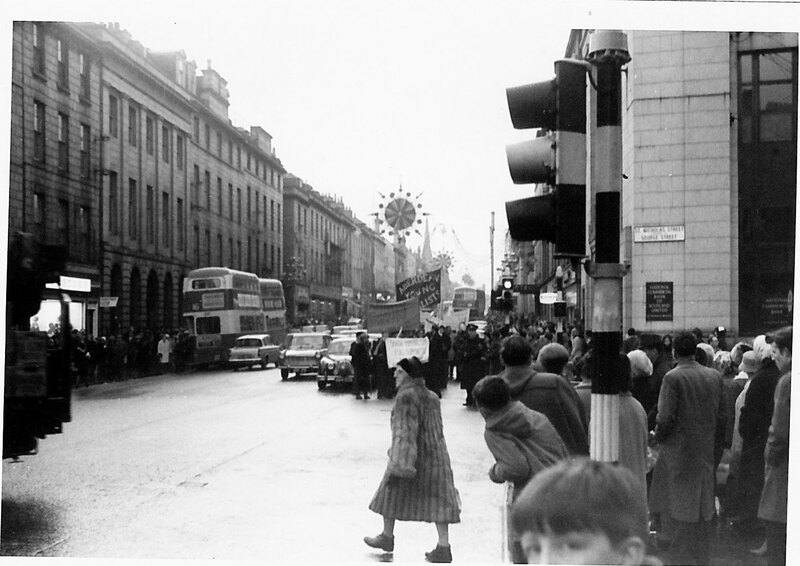 At weekends there were often demos, comprising large numbers of participants and the street lined with hundreds of onlookers as marches paraded noisily up Union Street, turned, then walked back down again, causing no little disruption to city centre life. Weekends were also the times for parties on the beach or in houses when parents were out of the way. 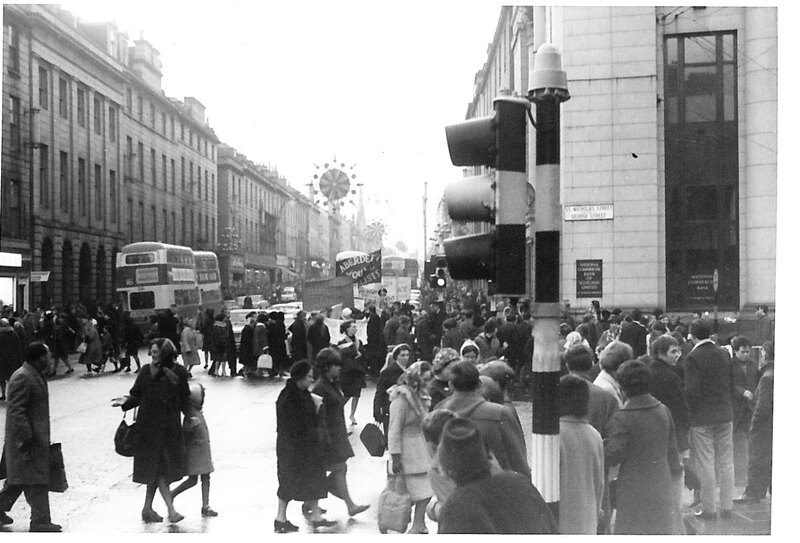 The extensive social aspects of Aberdeen YCND extended to “bohemians” from the art school. Socially members of YCND came from the skilled working class and petty bourgeois/management backgrounds. Although many of the members eventually became students at university, YCND was never a student organisation. There were a few Trotskyist students who came along but they were somewhat the oddballs and on occasion looked on as too stuffy and tight-arsed. Hill walking and climbing became part and parcel of Aberdeen YCND’s social circle. Large numbers of variously attired youths would descend on Deeside by bus while lucky ones got a lift in the car belonging to the only member with his own vehicle. Hitch hiking was the common means of getting around on the cheap. Mountain bothies became second homes for weekend stays: on one occasion a large party of hairy and boisterous YCNDers were about to pack up after a stay beneath Lochnagar at the Gelder bothy when some practising climbing techniques in a tree spotted a convoy of Land Rovers approaching from Balmoral. A group of royals spilled out. I don’t know who was more shocked however, possibly feeling the necessity to address her subjects, the Queen sauntered over and asked about our organisation, ‘the YMCA’. Momentarily puzzled, then the penny dropped, someone had scrawled YCND across the gable of the bothy with a charcoaled branch from the previous evening’s fire. 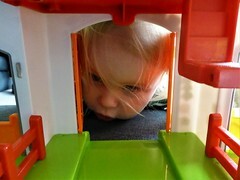 She was disabused of her error and offered a packet of pea soup. We had, after all, eaten our dinner and were about to leave. She declined. The minders in her party encouraged a swift retreat for the YCNDers who had no desire to linger on in the company of the British Establishment. From the start Aberdeen YCND refused to stand on ceremony, refused to acknowledge any debt to the local peaceful marchers. 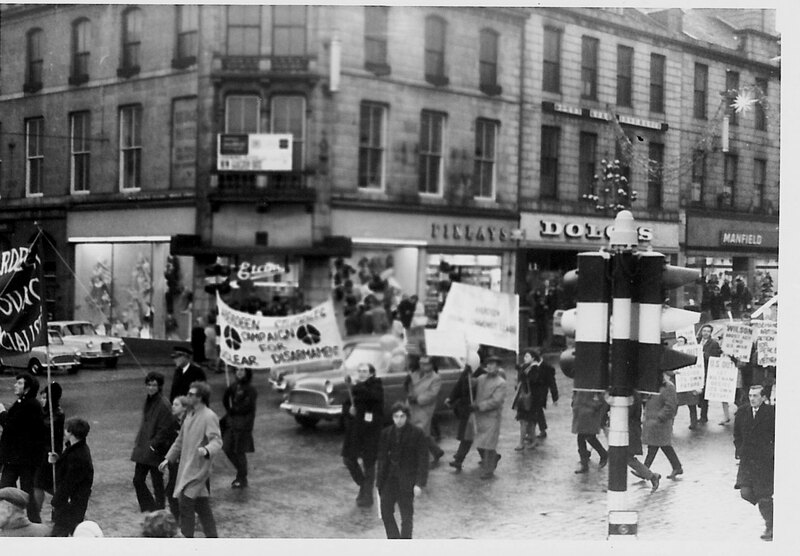 Local marches by CND (made up largely of “old folk”) were disrupted by YCND members who would frequently hijack a demo to lead it with its own banner. When the Labourites and Communists called for the US to get out of Vietnam YCND denounced Ho Chi Minh and his backers. YCND did not ask for permission to march, it was taken to be a right not a privilege. 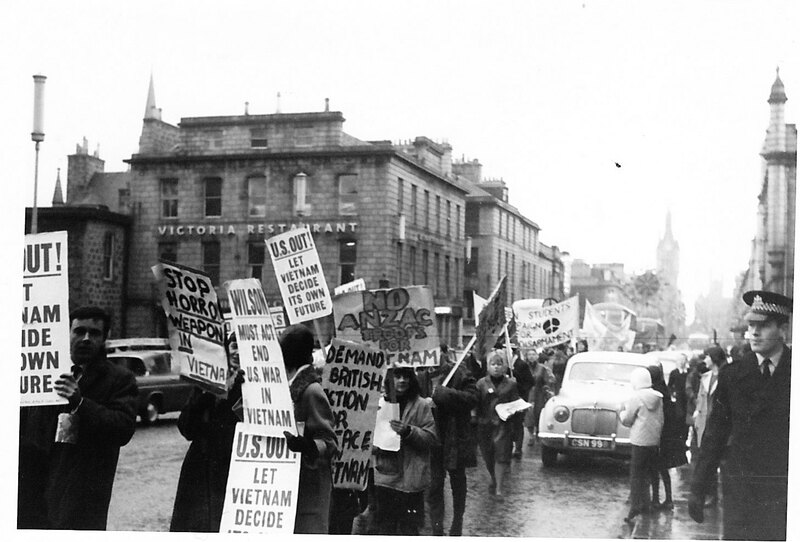 Apart from local protests, which were frequent, big, noisy demonstrations along Union Street on a Saturday as well as fasts and collections were organised against poverty – often at the King Edward statue on Union Street and Union Terrace ; the US base at Edzell was a particular target for marches (someone’s mother’s bedsheet requisitioned as a US flag – the stars and stripes painted onto the sheet as it hung against a bedroom wall and while the flag came our fine, so too did the imprint of the painted stars and stripes on the bedroom wall. Such is the price of radicalism). There were vigils and bold direct actions, and the magazine Megaton was published which was sold by hand in the town and local housing schemes. Small and large direct action was taken against offices and institutions regarded as part of a military state which led to arrests of members. Whitewashing slogans on pavements (a nocturnal activity inherited from militants of the 1930s) was a regular affair which often led to a night in the cells (even though it was perfectly legal) or other hassles by the police (young supporters would be asked their father’s occupation when they were too young to have one themselves). Although YCND was explicitly set up to oppose nuclear weapons it was such a wide-ranging body that questions of class struggle, the politics of war and imperialist rivalries became more important than the single issue. For the more politically engaged members, who irrespective of any anarchist commitments tended to be viewed as “leaders”, the single issue of nuclear weapons was seen as a product of the problem. And the problem was capitalism. So there slowly emerged more politically directed analysis of class, tactics, strategies and goals. The first signs of this were debates about anarchist syndicalism which evolved into a split between those who stayed with an anarchist-centred view and those who favoured “libertarianism” with a Marxist tinge. At the same time young folk grew older and for those with no commitment to strong political positions YCND became increasingly irrelevant. Leaving school, going to university or jobs brought them alternatives to YCND. For the politicos, debate tended towards forming factions committed to differing world views and this inevitably led to YCND being seen as a vehicle no longer capable of supporting new political goals. Ha, think I’ve got you. Changed your gender. It was the Miranda that confused me because I associated it with Miranda who’s younger. Anyway if you want email me at thehyena.lena@gmail.com. Cheers L.
Tom Paxton did not burn his draft card at the anti-Vietnam war rally, it was a university lecturer called Harry Blokker from the USA, ashamed of what his country was doing. Apparently he was later astonished to find that a report and photo of his actions appeared in his hometown local newspaper! That’s not what I remember. Which organisation did you arrange it for? What were you involved with back then? When I saw the advance publicity for Paxton, I thought it was too good an opportunity to miss. I wrote immediately to the Chief Constable for permission to hold a demo the day of the concert & got it. The only time you got turned down was if something else was planned for that day. I must have asked YCND for support, but think I got the letter off first. I then contacted Paxton’s agent to invite him to lead it & they left it up to him. As you know, he was there. 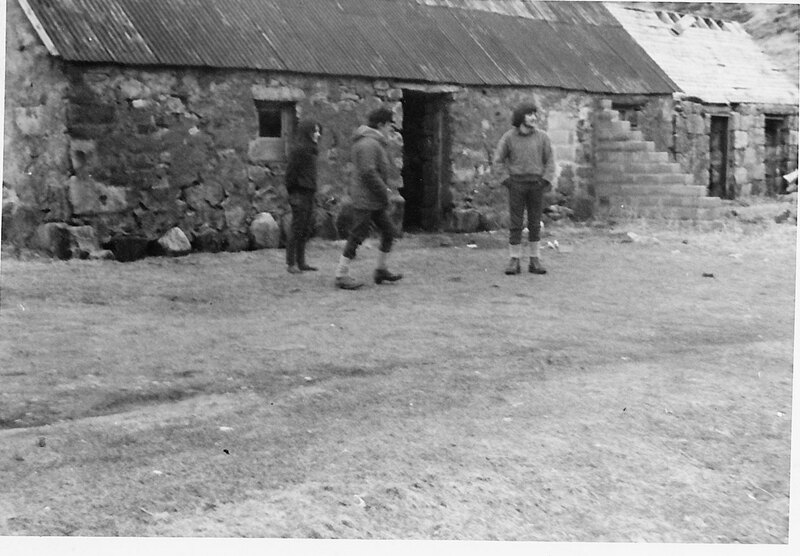 You must be the girl who married the mountaineer to the right of the bothy door- is that Callater Stables & you on the left? It’s all so long ago now! In the pic of the front of the march going past Etams, I’m 3rd from the left with the Donovan cap & the 12-string guitar which is hardly visible. We could carry on this conversation by email if you wish. Thanks for the info. Sounds painful. Think there might have been a few scooters going around then. Probably best letting sleeping scooters lie. Can anybody tell me if they remember a scooter that was painted with ban the bomb symbols/colours, am trying to trace the history of this scooter number plate no XUV 511 last owner said it was used in Scottish demo/demos thank you Boon. I’ve asked. 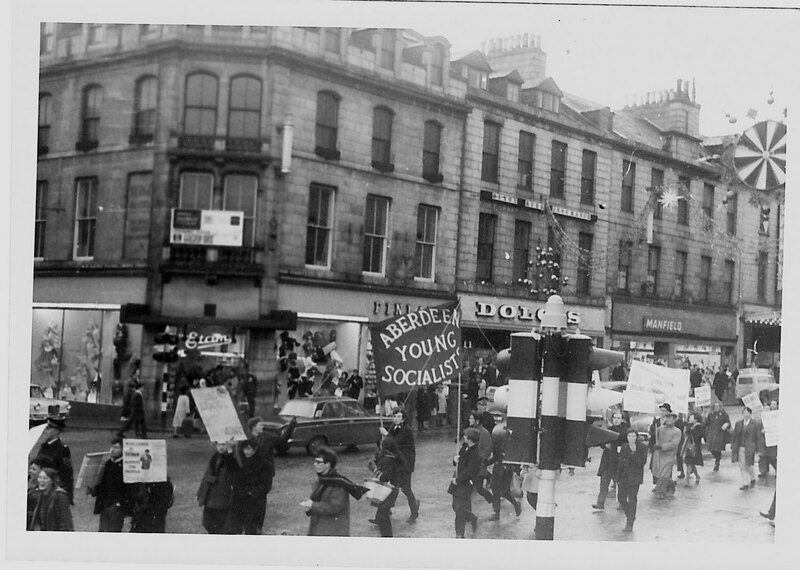 There was some guy who had a scooter and was involved in left-wing politics in Aberdeen in the 1960s. Whether it had symbols painted on it my contact doesn’t know. Sorry. Mike McCrone used to come to YCND meetings and had a scooter until he fell off it on Balgownie beach one Easter and broke his leg but it never had any symbols on it. Happy days – I remember them well. Nice selection of photos too with many well kent faces amongst them.